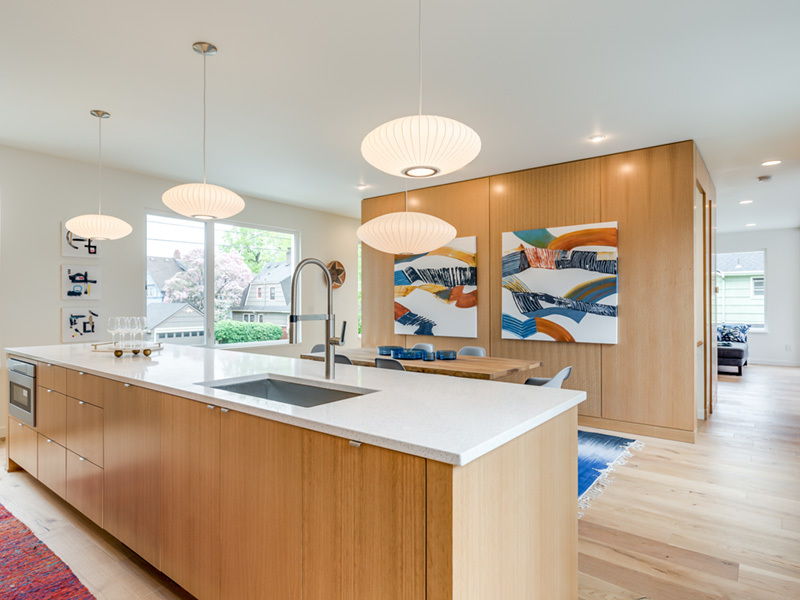 The Portland Modern Home Tour is Today! Bookmark the dynamic Google Map. To use it, just tap or click on any number and the address will be revealed. Purchase tickets at the door of any Tour home ($50 cash or check) between 11am and 3pm, or click here to purchase tickets online and bring your ticket (or your receipt on your mobile device) to any Tour home and exchange for a wristband. You know "that" house? The one you wonder about every day? This is your chance to get inside! 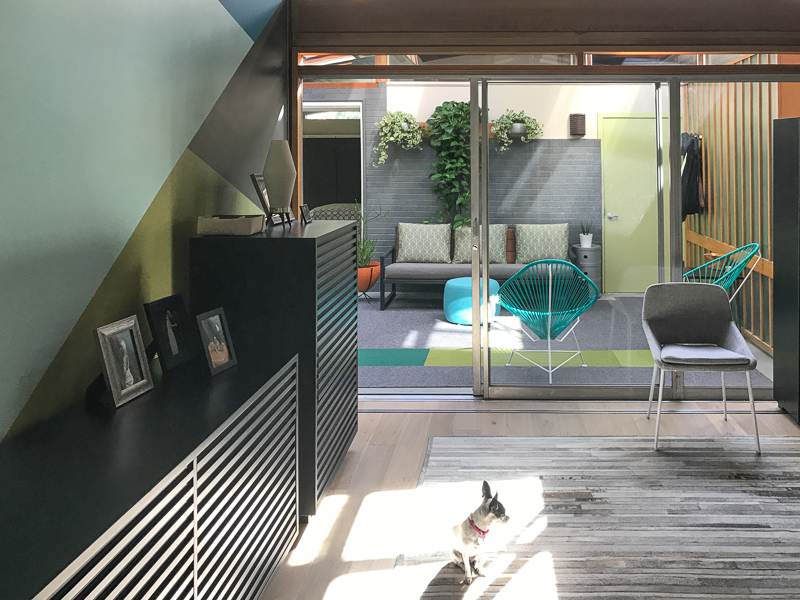 The Portland Modern Home Tour is your once-a-year chance to get up close and personal with the architects, designers and amazing homes that define “modern” in Portland. Click to take a peek inside. Remodel Architect: Walker Templeton, Templeton Built. 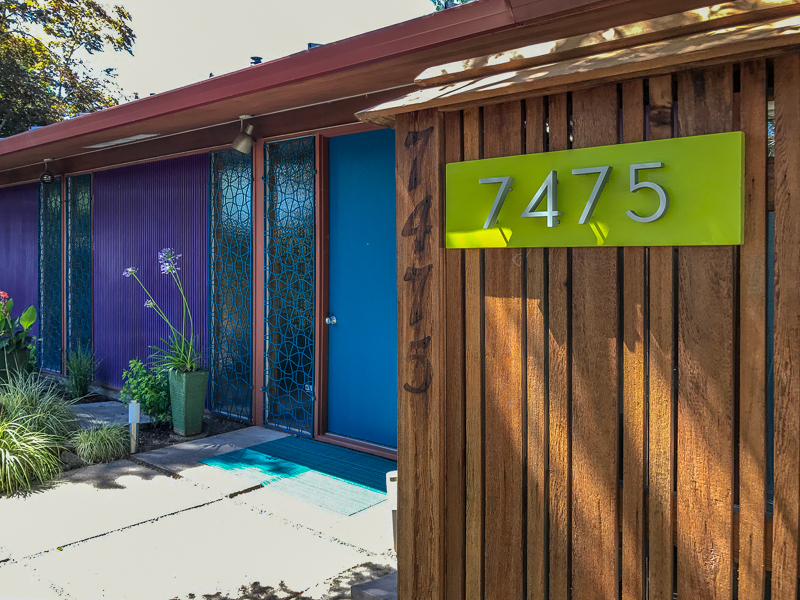 This home is a remodeled 1958 daylight basement ranch. 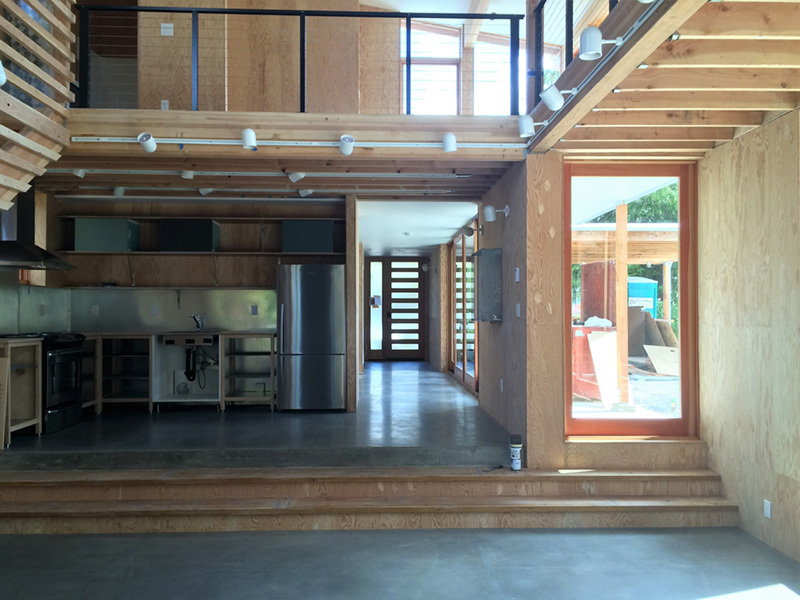 The house was deconstructed, roof was removed and the home was stripped to the studs. The existing basement of the home opened up to a very large flat back yard but was not used because of low ceilings and lack of daylight. How could the large basement be utilized and the connection to the backyard be established? 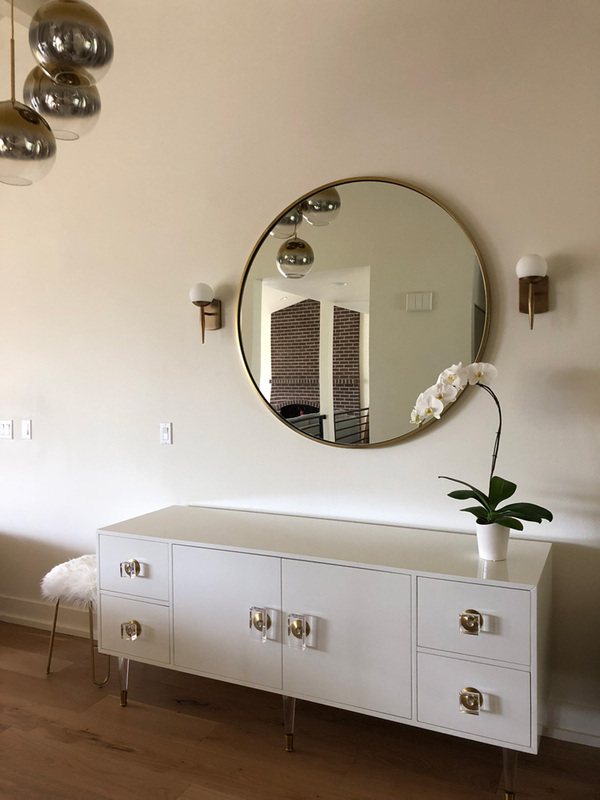 The solution was reverse living – all bedrooms were placed upstairs and a master bedroom addition was added and the kitchen, living room and family room were moved downstairs. The floor joists were cut in half creating a double height space along the entire back of the home. 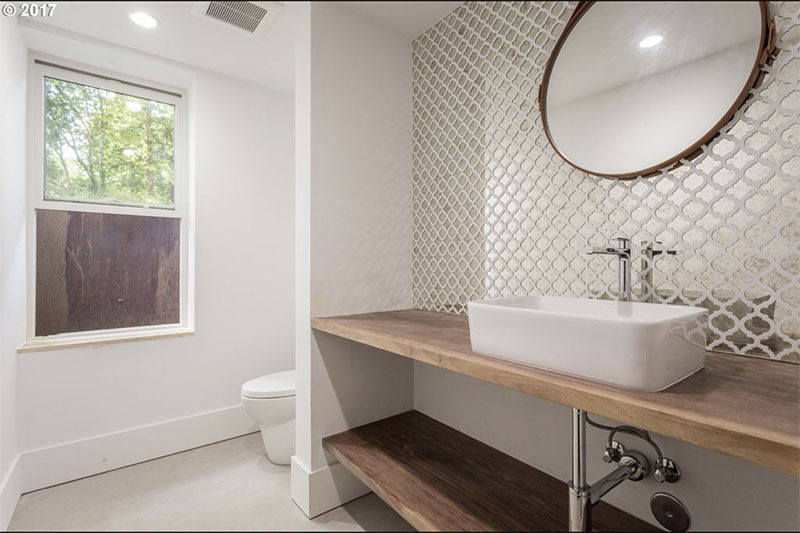 The remaining low ceiling spaces became utilitarian – mechanical room, mud room, pantry and powder bath. The addition to the ground floor steps down to allow for higher ceiling in the family room. 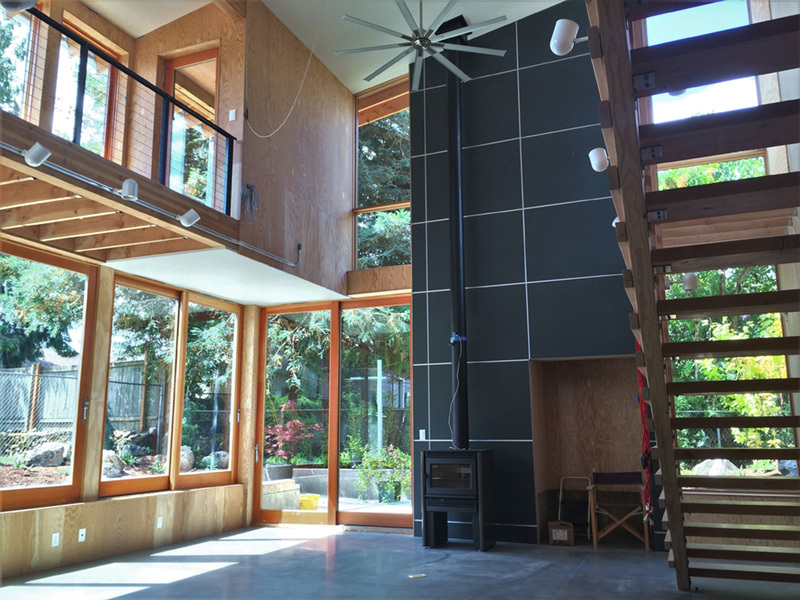 Radiant floor heat, ducted mini splits, double the insulation required by code in the walls and roof, metal rainscreen facade, reclaimed material used throughout as well as durable, natural materials like stone, concrete and metal make this home an extremely energy efficient and low maintenance. 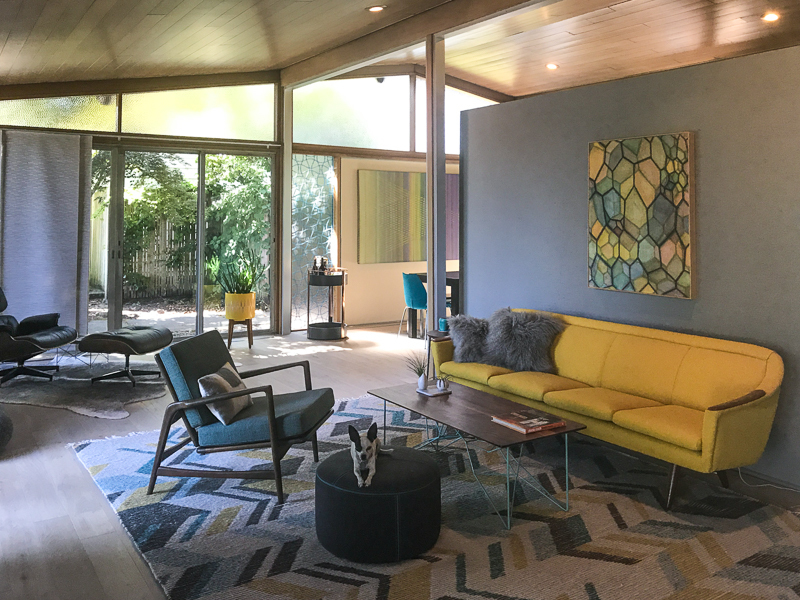 This house was designed and built by Drew Hastings of Raphael Design for his family (his wife Jessica and their son Arlo). 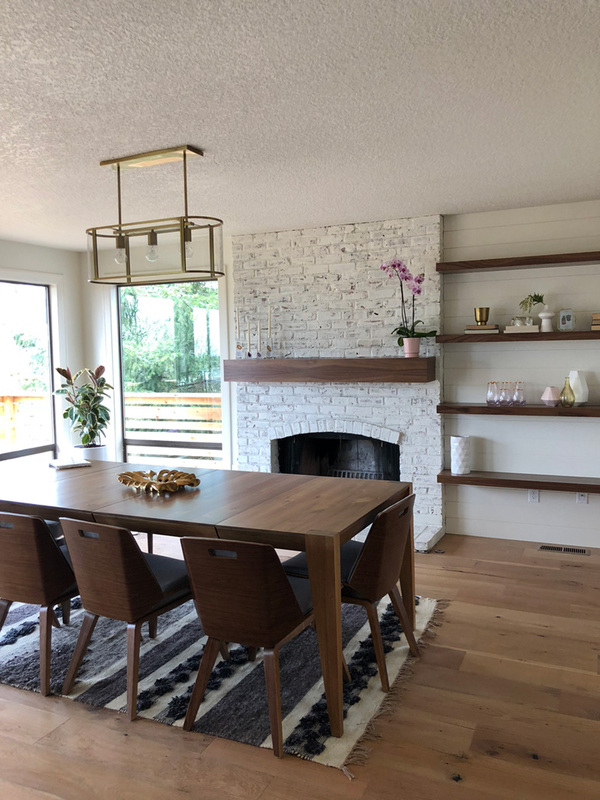 The lot was created when Jessica’s parents split off one third of their three-lot property on 56th and Hawthorne Blvd in the Mount Tabor neighborhood of Southeast Portland. The house is 2,100 sf with 3 bedrooms, 2.5 baths. The family knew they didn’t have a huge budget to design their forever home so they kept the form very simple but wanted to achieve high-quality details. They ended up embracing the minimalist approach on a large scale as well as down to the details. For example on the exterior they’ve concealed the gutters and downspouts behind the siding to visually minimize the reading of the elevations. 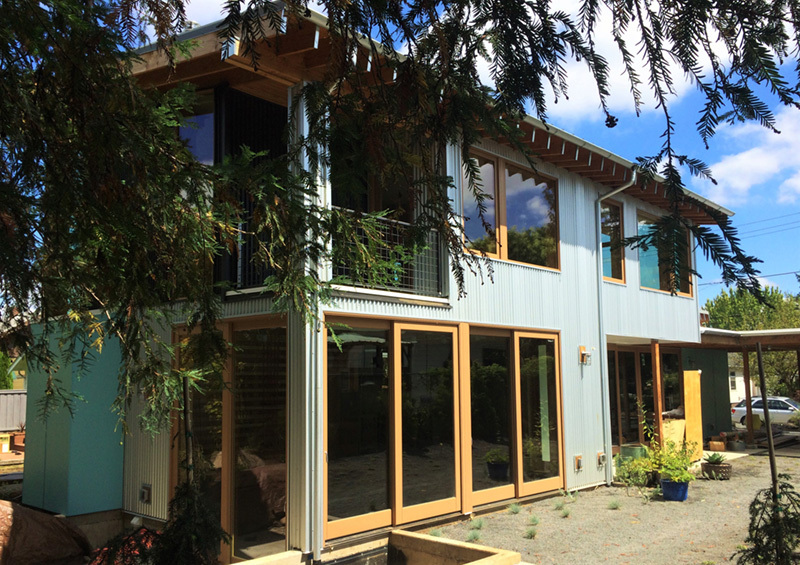 Hiding the gutters/downspouts opened up opportunities to enhance the rainscreen wall assembly by allowing for more rigid rockwool insulation to gain a higher R-value, a larger air cavity to help with moisture mitigation, and deeper window frames to add depth to an otherwise tight exterior. 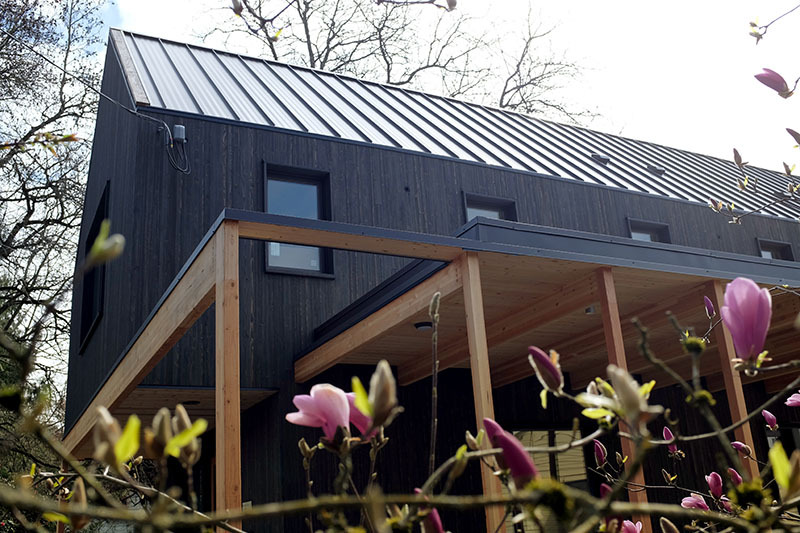 The exterior envelop design combined with the high efficiency mechanical systems give the house a lighter carbon footprint. 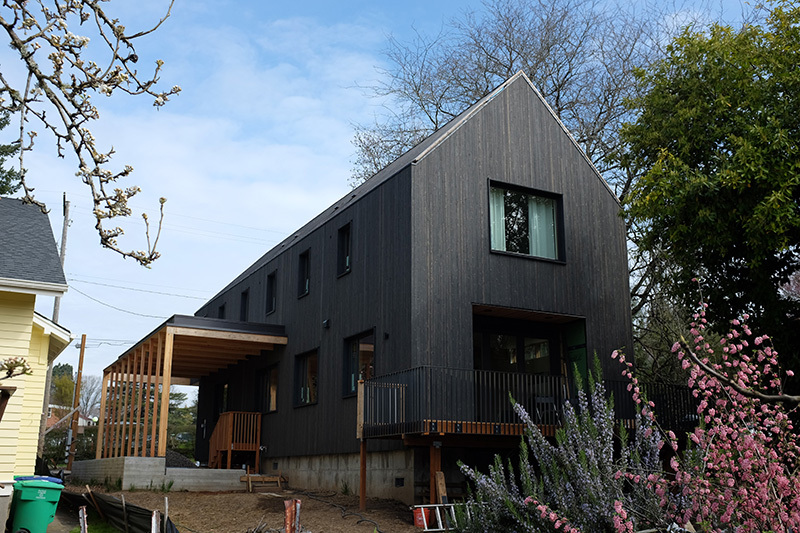 The form of the house is archetypal gable shape–modern but referencing the 100-year-old neighborhood it inhabits. 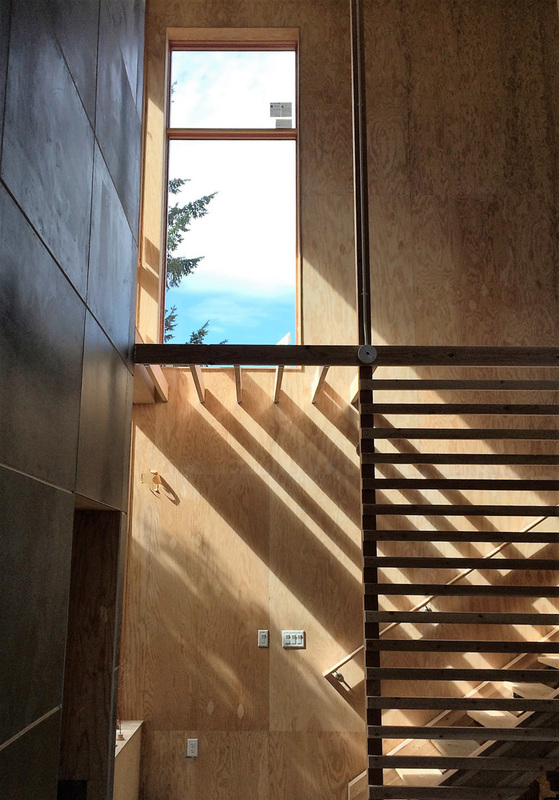 Because the lot is narrower than the standard one, the family also wanted to take advantage of the daylight on site. 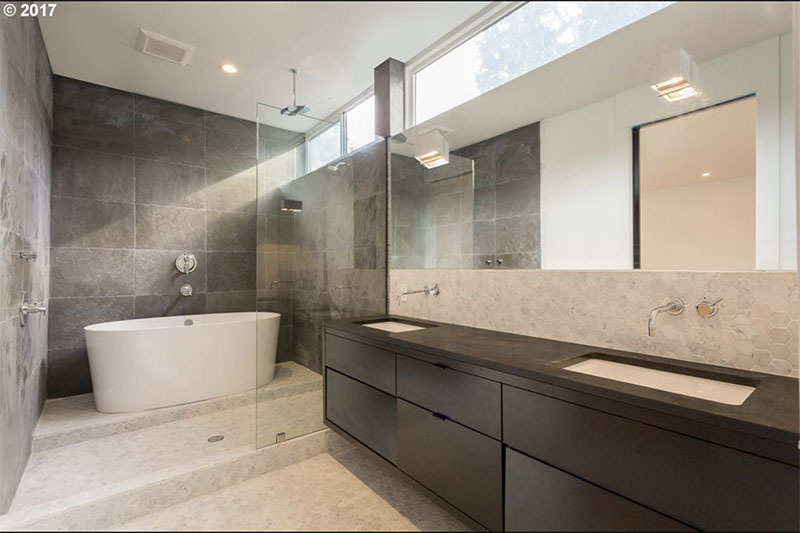 Instead of a garage there is a screened carport, and in the stairwell and master bath there are ribbon skylights to bring light into the middle of the house. And being amongst the tall trees of the Mt. Tabor area they wanted wood to be the primary material on the exterior. 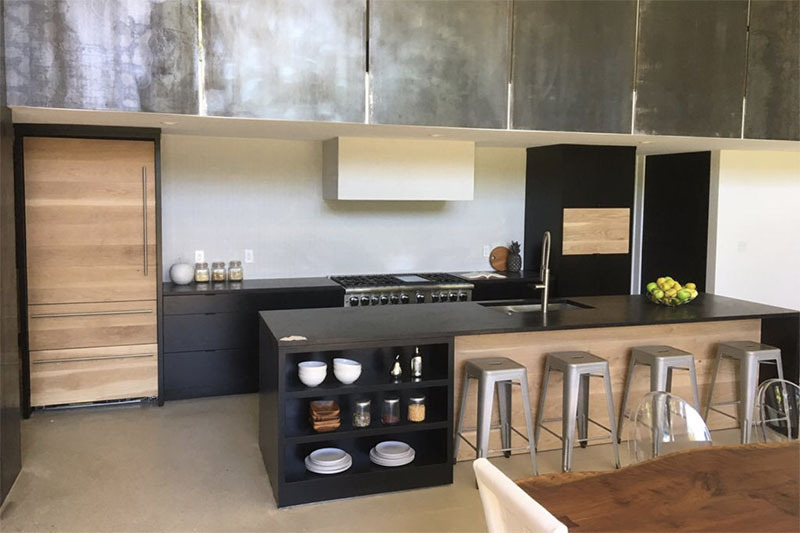 As the home owner, architect, and contractor, Drew was able to have custom details and craftsmanship throughout the design of the house. 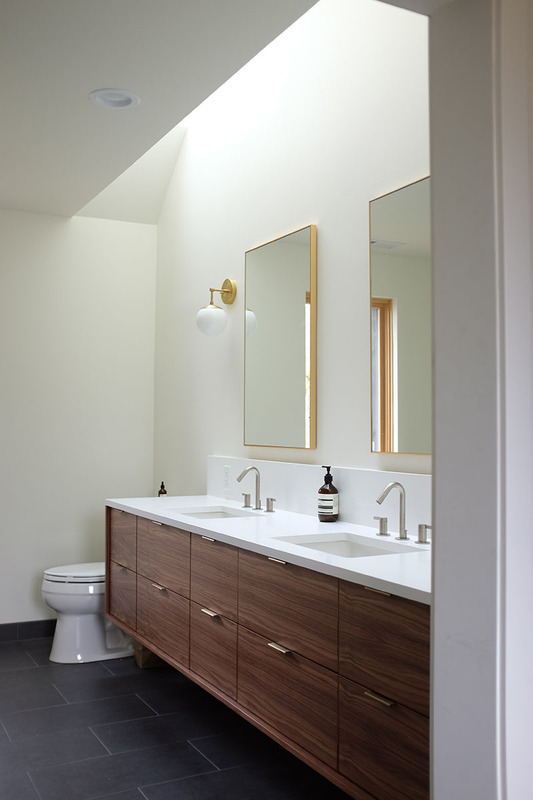 This is reflected in particular in the custom cabinetry, stair woodwork, and exterior detailing. 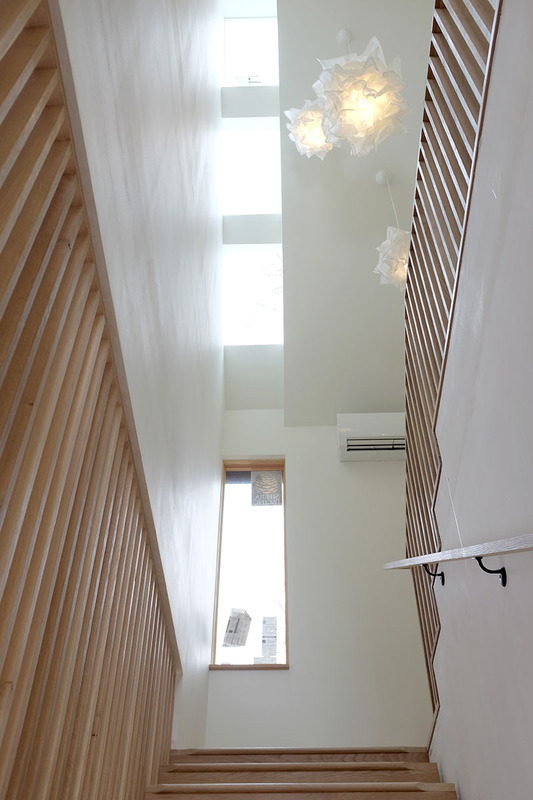 Conceived more similar to a loft type space rather than a traditional single family home, the homeowner was seeking to challenge a normal arrangement of rooms in favor of spaces that are dynamic in all 3 dimensions, interact with the yard, and capture the movement of light and air. As an artist that explores the beauty of natural objects and scenes, she tasked us with creating a building that was not precious – one that explores the essence of its raw building materials and is not afraid of expressing them as finished. 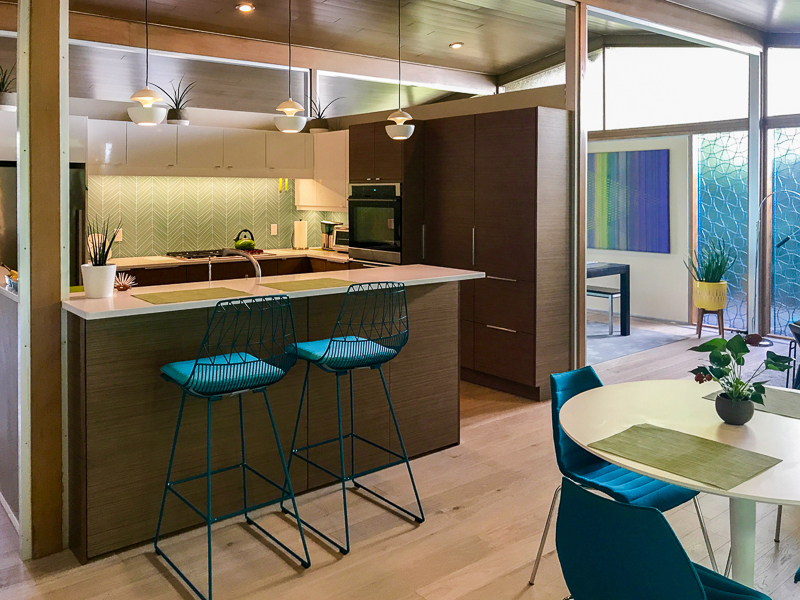 We designed opportunities for kinetic fixtures, many built by the homeowner, to allow flexibility and movement. 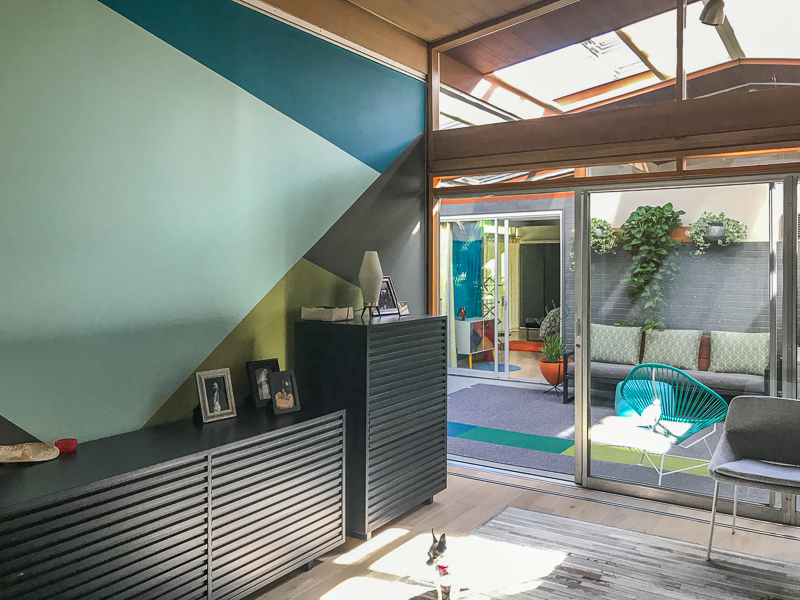 The result is a building that compliments the casual artistic lifestyle of the occupant as part home, part work space, part gallery. The spaces are interactive, contemplative, and fun. This “Alcoa Care-Free Home” is one of 24 model homes that were built throughout the country in 1957 utilizing aluminum as the main feature. Unfortunately, they ended up costing double what they had thought they could build them for, so the remainder of the projected 50 were never built. As far as I know there are no others on the west coast. 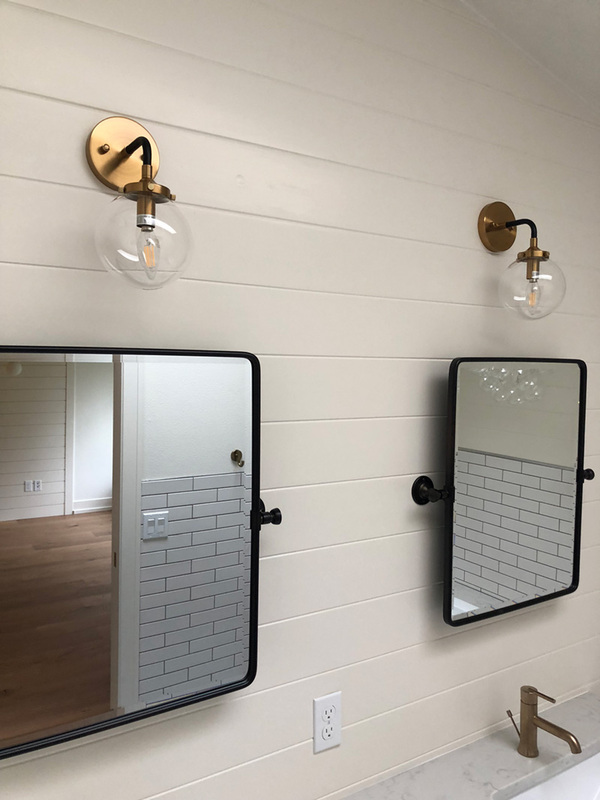 We purchased this house in 2016, and realized it was in need of some very crucial upgrades immediately. So we got to work on replacing old plumbing with PEX, re-did the low-voltage lighting system, and the electrical panels, new flooring, sheetrock, paint, etc. Upgrading the kitchen was our latest project. Other owners have changed things as well along the way, but the original footprint remains the same. Back in the 90’s the open atrium was enclosed and the bedrooms reconfigured, I’m not sure when the original kitchen was remodeled, but I kept the design of the remodel for its efficiency. 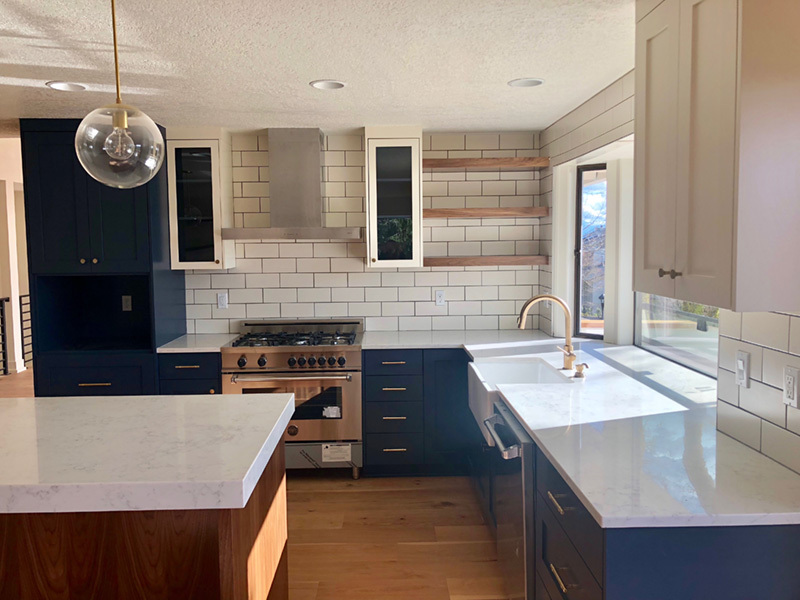 For those of you that may have seen this house when it was for sale, I think you’ll like the improvements we’ve made, and that we’ve kept everything in line with the architect, Charles M Goodman’s, original intent. This home may not be Care-Free, but it’s a joy to live in!! 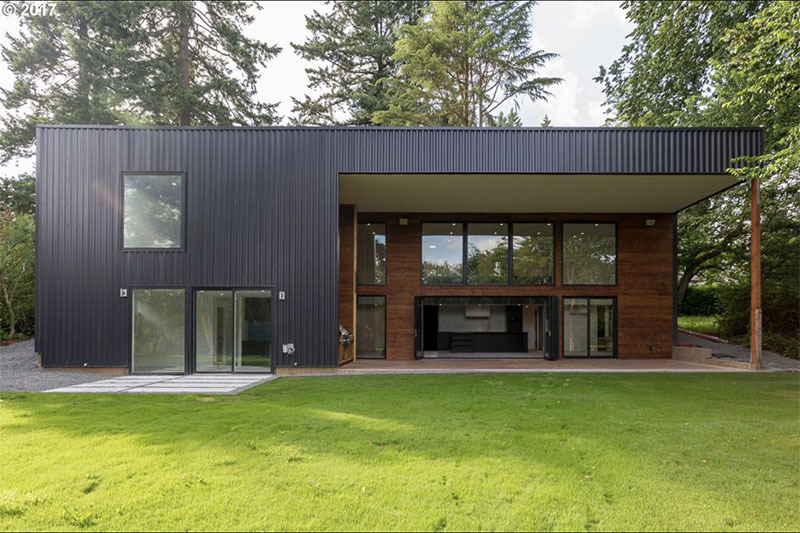 This property is truly an example of how good modern design can completely rejuvenate an outdated property. 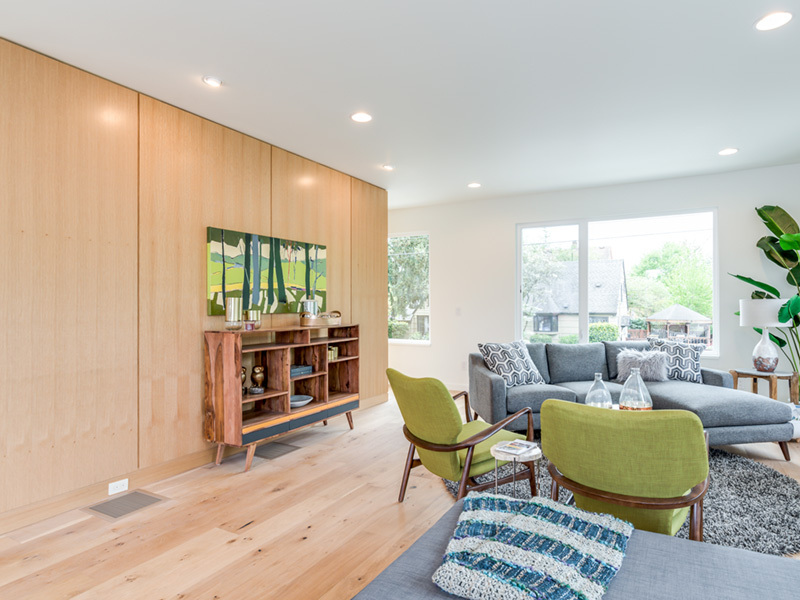 The home was featured on the 1981 Street of Dreams tour and was filled to the brim with early 80s home building trends… unfortunately little had been done in terms of updating the property since then so when the new owner purchased the home, she knew she wanted to have some major changes made. 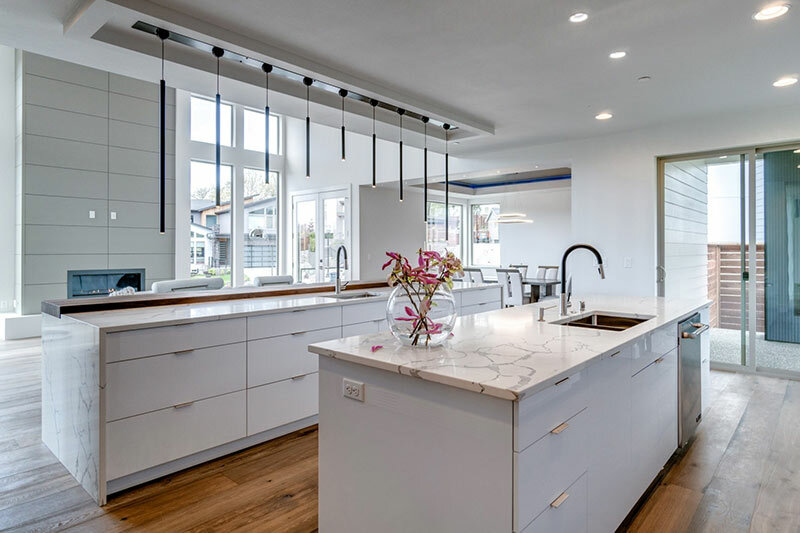 Out went the oppressively dark, floating cabinets, and in went a stunning island, new lighting and gorgeous fixtures throughout. 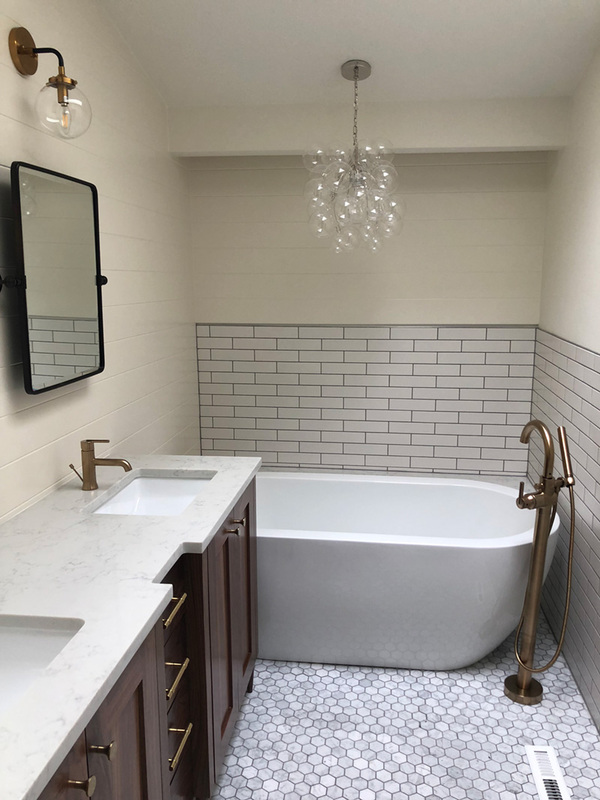 New flooring, new cabinets, new tile work, a new soaking tub, and built in Bluetooth speakers breathed new life into the property and made its early 80s bones seem strikingly fresh and modern. 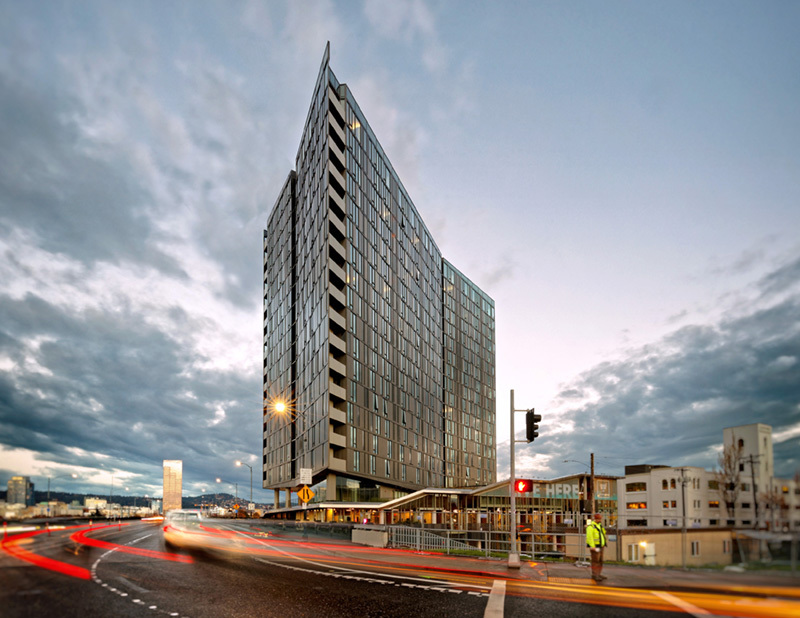 Located at the geographic center of the city of Portland, YARD is a 21 story mixed-use building that combines residential, commercial, retail, office and parking. 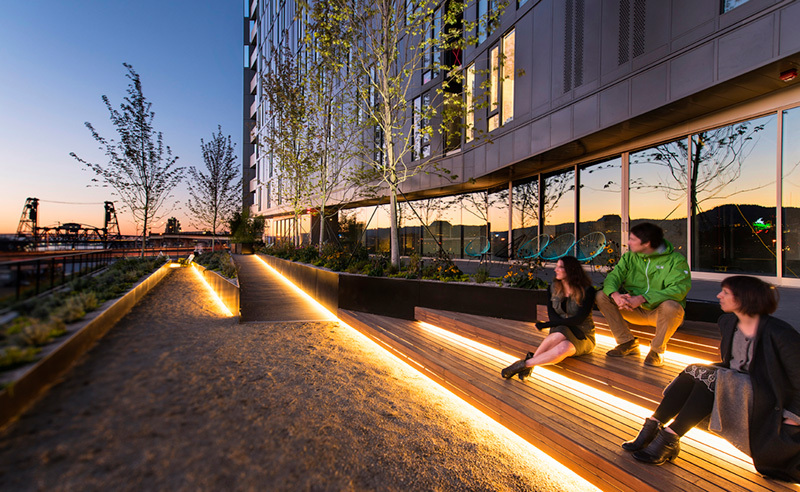 Positioned in the rapidly changing Central Eastside of downtown, at the base of the iconic Burnside Bridge and skatepark, the site presented a multitude of challenges, both at an infrastructure and cultural level. 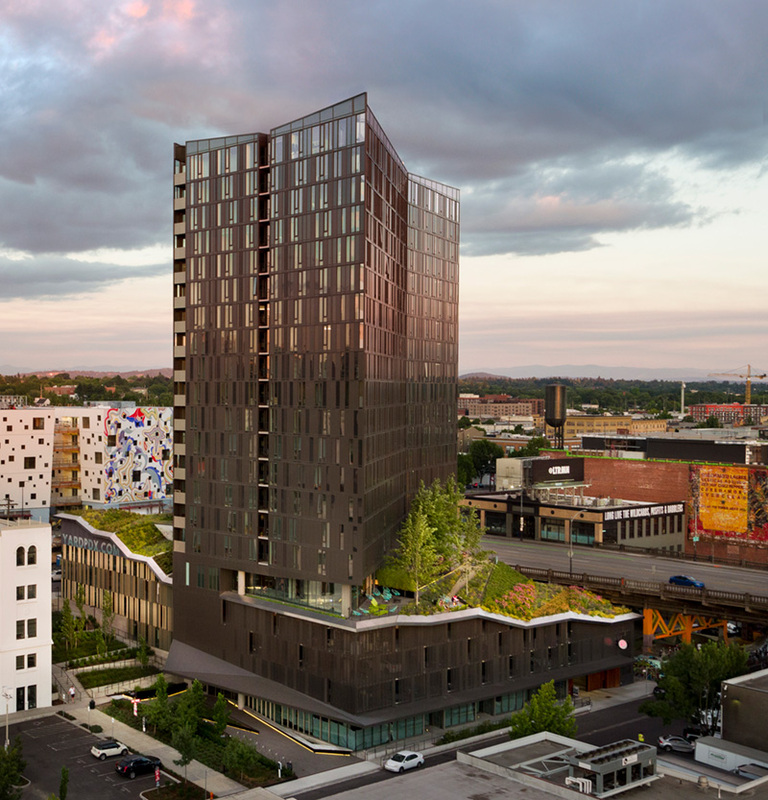 As a podium + tower design, YARD connects seamlessly with the neighborhood via the intersecting streets and across the city skyline. 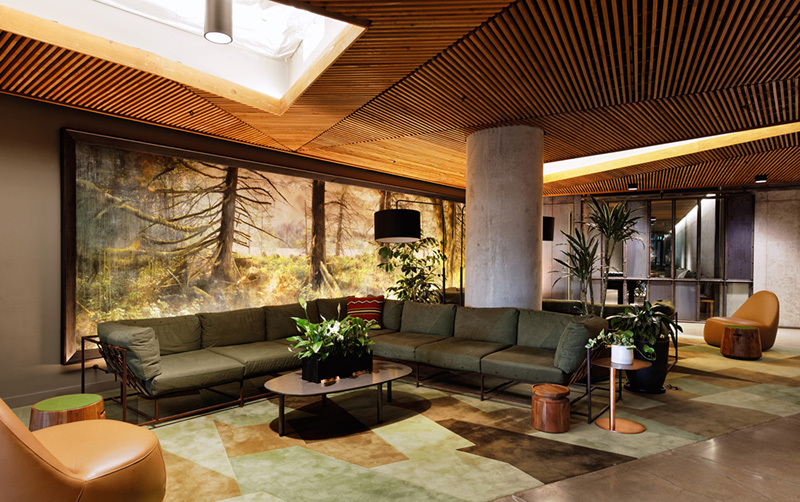 The podium at level 5 is open to the public, offering spas, co-working space and eco roof encouraging Portlanders to take advantage of unprecedented views of the city. Above the podium is a residential tower rotated along the river and oriented to maximize connections to the urban landscape to the west and dynamic mountain views to the east. 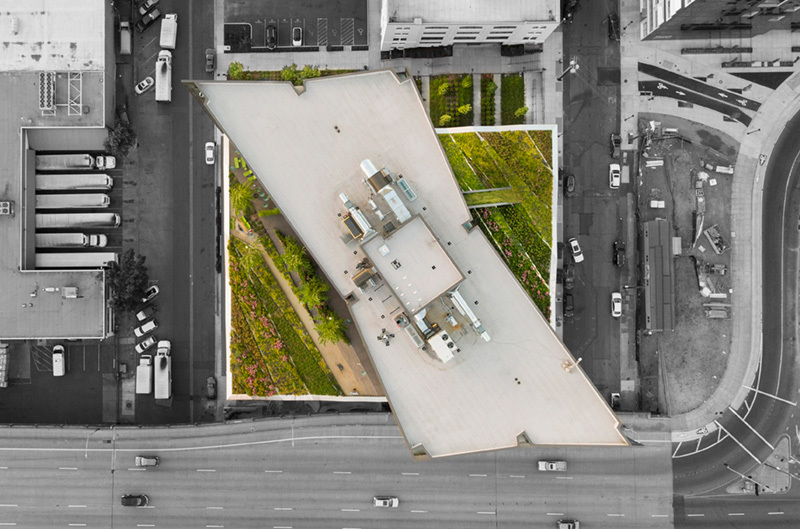 YARD is a catalyst project born of the city’s effort to revitalize entrepreneurial development. It’s the spark of a new neighborhood, a rare opportunity to remix pre-established elements (like the iconic Burnside skatepark) with groundbreaking design and an under-utilized riverfront location. Urban Portland is becoming increasingly dense as homeowners seek neighborhoods with walkable amenities and schools. 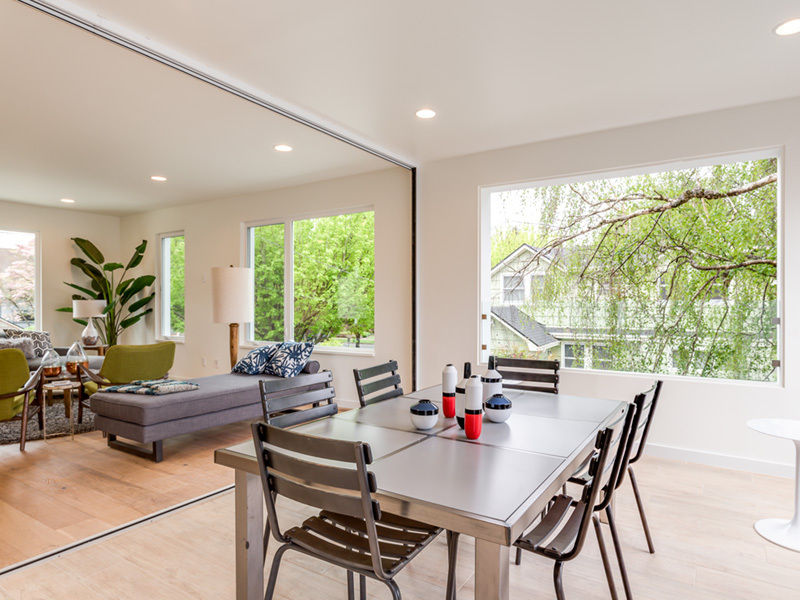 Taking advantage of building code that allows attached homes on corner lots, award-winning architect Ben Waechter designed this modernist 2-home project to take advantage of expansive, light-filled views afforded by a 3-level structure. 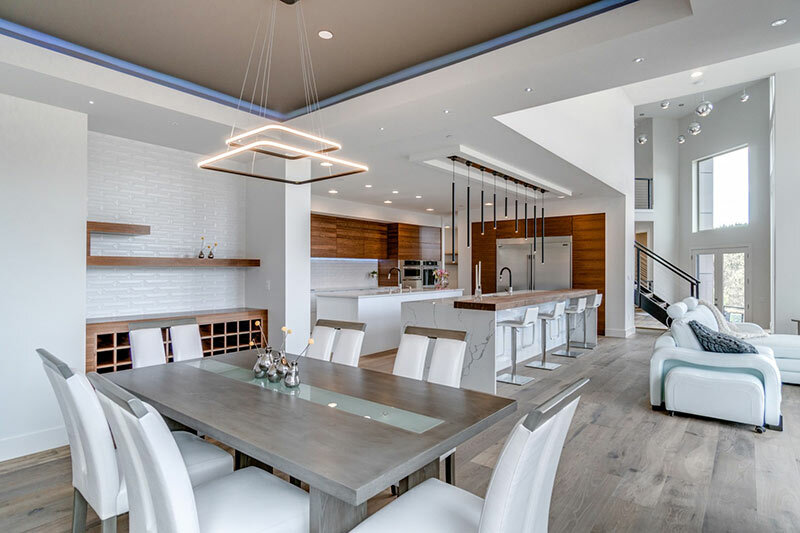 The second level living space is highlighted by a 20’ wide stackable glass wall system separating the kitchen and dining room from a private covered balcony that blurs the line between indoor and outdoor living. 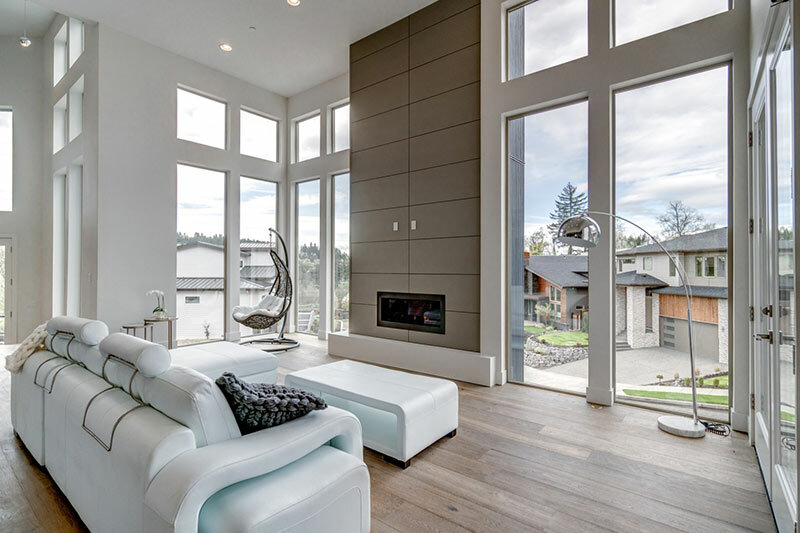 Interior designs by Oregon Homeworks feature a monochromatic palate of warm walnut throughout the custom cabinetry, hardwood floors, and a dramatic paneled stair column with hidden powder bath and pantry. 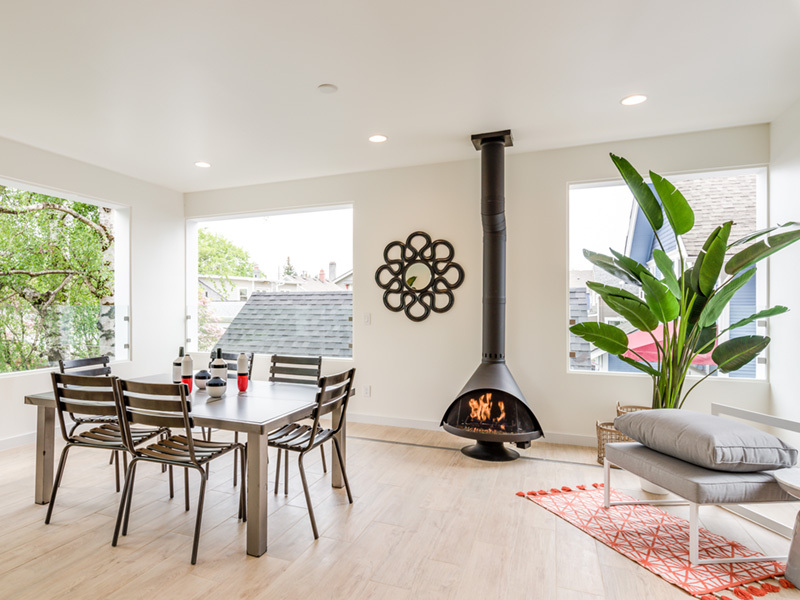 Only steps away from the Beaumont-Wilshire neighborhood’s highly sought-after businesses and schools, the 4 bedroom, 3.5 bath layout features a ground floor guest suite with separate entrance, perfect for a home office or short-term rental. The home is offered for $1,100,000. An after-party, included in the ticket price, starts at 4:00 PM and continues after the tour until 7:30 PM. 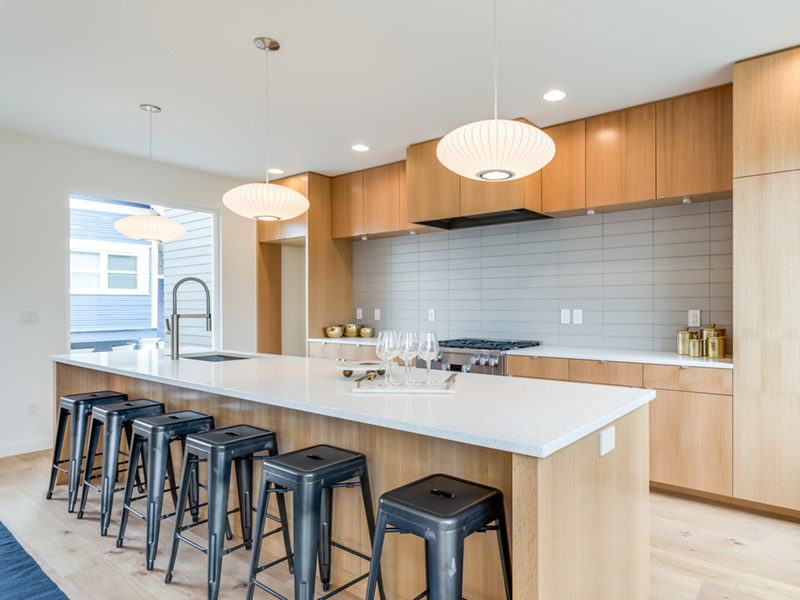 Hosted by Modern Northwest, explore a couple of modern homes in their Deerhaven at Lacamas Lake development and enjoy a hot meal, light refreshments, raffles, drinks, live music and more. This home is located at Deer Haven in the Lacamas Lake development. 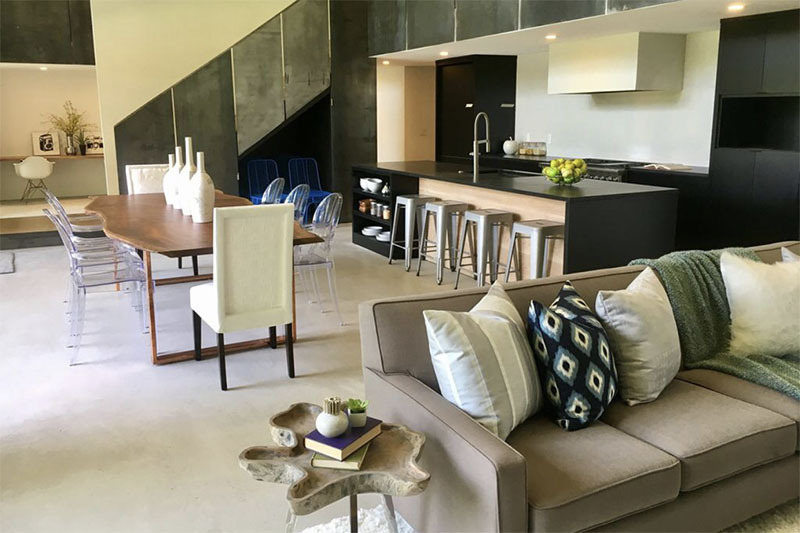 It is surrounded with homes like it; modern, contemporary and custom made, but our AFTERPARTY HOST HOME is something that’s also altogether different. The soft-tone colors of the exterior and interior and natural wood sidings humble the truly magnificent and unique architecture. 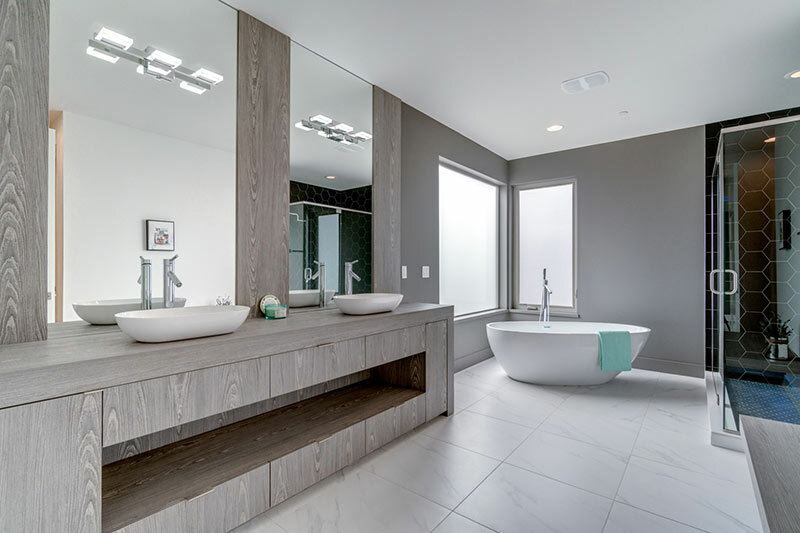 With 4 bedrooms, 4 bathrooms, 1 office and the interior is sleek, simplistic, modern; and yet it still emphasizes a “homey” and comfortable feel. We’re thrilled to invite you to share your day with us starting at 4pm! Sure – some of our best guests are aspiring architects and designers. Kids under 12 are free, and we ask that you keep the little ones close at hand. Remember, people are opening their personal homes to us for a day, so please help us respect their property!